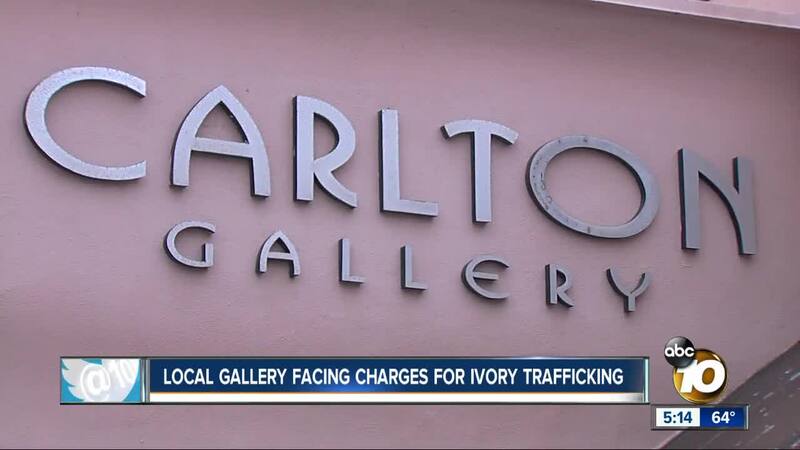 SAN DIEGO (KGTV) - The owner of a La Jolla art gallery and an employee were charged over the illegal sale of ivory, the San Diego City Attorney’s Office announced Wednesday. “The investigation into Carlton Gallery began in May 2017, when wildlife officers from the Department of Fish and Wildlife’s Trafficking Unit observed two art-deco sculptures that appeared to be ivory in the gallery’s Prospect Street display window. In December 2017 and March 2018, wildlife officers returned and observed additional items that appeared to contain ivory. According to state law, two types of ivory products are exempted: musical instrument that are made of less than 20 percent ivory and were manufactured no later than 1975, and antiques that are made of less than 5 percent ivory and are more than 100 years old. Neither exception applies to the items seized from the Carlton Gallery, authorities said. Under state law, a first-time offense of the ban is a misdemeanor punishable by up to a year in jail and a fine of up to $40,000. Kupersmith was charged with eight counts of the purchase and sale of ivory and rhinoceros horn and eight counts of the unlawful importing, possession and sale of a specified species. Cohen and the Carlton Gallery are charged with 11 counts of each.